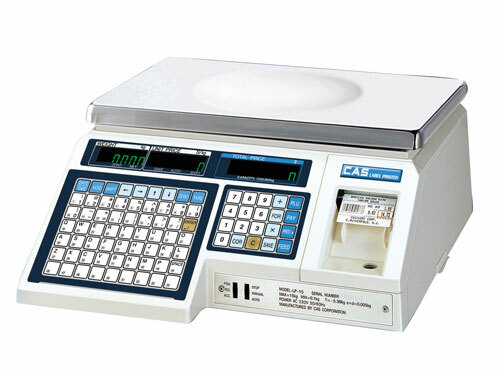 Label Printing Scales, or Deli/Meat scales, are devices that allow you to weigh an item away from the POS and print a specialized price label. 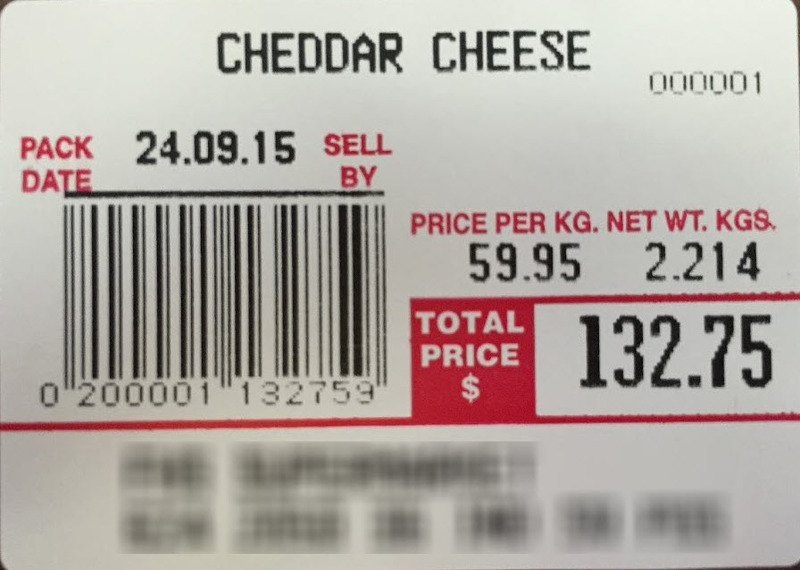 These labels are often called "price embedded", because the price of the weighed package is embedded in the barcode. StoreTender can read the labels produced by these scales and determine the price (and weight) of the product, provided you've performed some basic setup first. 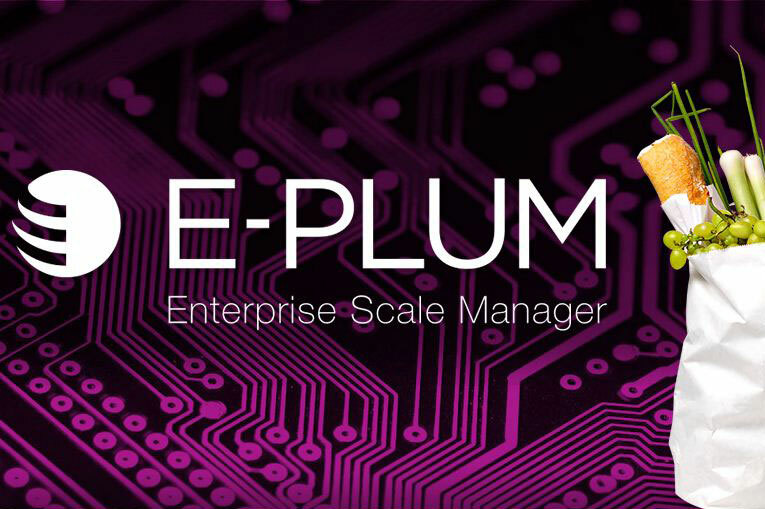 You create your PLU numbers in both the scale and StoreTender. The PLU number on a price embedded label is a (maximum) 5 character PLU. 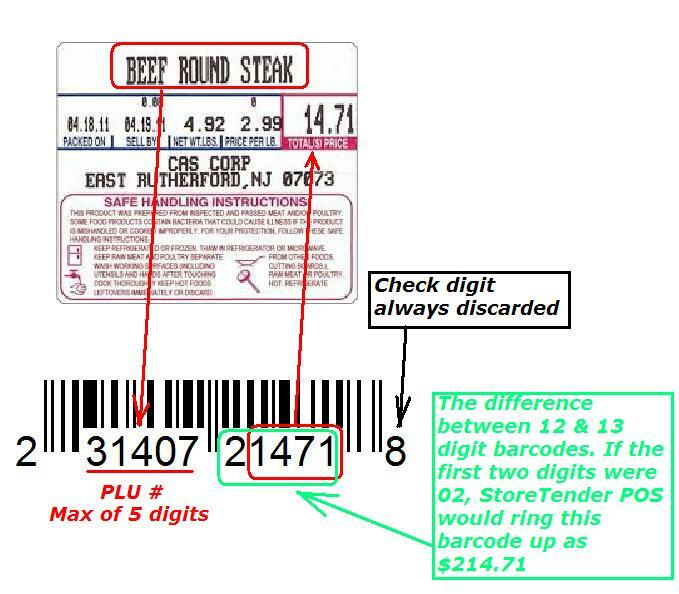 When the label is printed, it will be (depending on the scale settings) a 12 or 13 digit barcode, beginning with a "2" or "02". These starting digits signify that the barcode may be price embedded. This tells us that this could be a Price Embedded Barcode. StoreTender then examines the next 5 digits to see if it is a Product PLU in the database. This is the Product PLU that StoreTender checks. PLU number for these items should always be 5 digits. If not, your scale will "pad" the number with leading zeroes. However, in that case, you should enter the Product PLU in StoreTender to include those leading zeroes. This is a check digit which is discarded, when the leading character is "2". If the leading character is "02", then this is the first number in the price. In the case where the label starts with "02" but the price is $12.45, this digit will be a "0". This is the 4 digit price of the item. You are limited to a maximum price of $99.99 if your lead digit is a "2". The maximum price is $999.99 if the lead digit is a "02". You set the lead digit in the scale, not in StoreTender. The last digit is a check digit, and is discarded. Now, let's go to StoreTender and create the Product to sell when this label is scanned at the POS. Navigate to Data > Inventory > Products and click New. 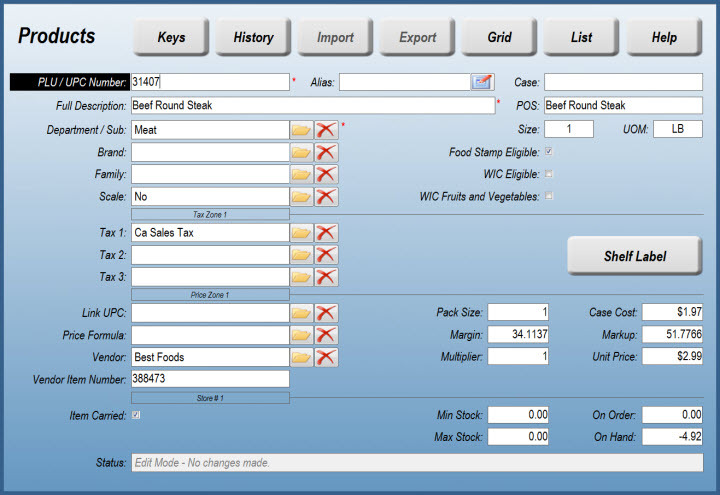 Here we have created the "Beef Round Steak" product with the PLU number "31407. Note that the "Scale" prompt reads "No". This is because you're not weighing the item at the POS, but are interpreting the barcode presented. If you want to keep track of your inventory levels and sales per unit of measure, be sure to enter costs. For example, assuming we're working with pound units, we've entered "1" for Pack Size with a Case Cost of $1.97. This means that we purchase 1 lb for $1.97. We also have a Multiplier of "1" and a Unit Price of $2.99. This means that we sell 1 lb for $2.99. For these items, always keep your Multiplier at "1". Now, when you sell a package using our example label, StoreTender will calculate the number of lbs. sold by taking the $14.71 price, divided by the $2.99 per lb. Unit Price, to equal 4.92 lbs. sold. This is a great way to keep track of your on hand and sold quantities. In most cases, labels that start with "02" use a 5 digit price, and labels that start with "2" use a 4 digit price. But what if your labels start with "02" and your scanners do not read the first digit? Now, you can use custom formats to define how your labels are read by StoreTender. Because the first digit read by the scanner is a 2, StoreTender would read the price as $32.75, not $132.75. To fix this we enter the following definition in the Custom Price Embedded Barcode Format, found at Setup > Store > Other > Measures. Total Number of Digits: 12 (200001132759 - the 12 digits read by the scanner). No. of digits in Price: 5 (again, a 5 digit price of 13275). As you can see, the ability to customize this format makes StoreTender very versatile, able to handle a variety of Price Embedded formats.